If you are planning a major development or a development generating trade waste and you need some pre-application advice, we recommend that you request a Services Advice Notice (SAN). Once you have gathered all information listed above, you can apply through the Developer Applications Portal. The portal will guide you through the steps for making your application. Once your application fees have been paid, our team will assess your application. If we require further information from you, we’ll issue a request for information by email and you will need to lodge the additional information on the Developer Applications Portal. The assessment will take 10 business days after a pre-lodgement meeting and/or receiving the necessary information and payment of the relevant fee. For more information, refer to our service commitments (PDF). What happens during the design and construction? Your Decision Notice will outline whether your application is deemed major or minor works. You will now need to engage an engineer from our list of endorsed consultants and arrange with them to design, construct and maintain the connection. We also offer Flow and Pressure Services Advice Notices for simple flow and pressure test information. Indicative flow and pressure curves from a computational hydraulic model can be provided for any part of our water network. Hydraulic field flow and pressure advice for existing properties is provided by private consultants. For details about consultants who provide this advice, please contact The Association of Hydraulic Services Consultants Australia Queensland Chapter or phone 07 3211 3262. Information provided by Queensland Urban Utilities is based on hydraulic modelling ("Hydraulic Modelling Information"). Model results are for the anticipated performance. The Hydraulic Modelling Information has not been verified by field measurements and may be inaccurate due to field conditions. As such, users relying on Hydraulic Modelling Information do so at their own risk and should make their own independent investigations to verify model outputs. The Hydraulic Modelling Information does not state nor imply a guaranteed level of service. 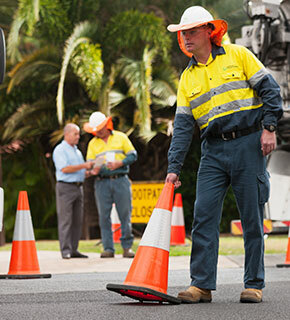 Designers are referred to Queensland Urban Utilities’ Customer Charter and Customer Service Standards for facility hydraulic service considerations. Queensland Urban Utilities does not provide a service of minimum flows and pressures to private fire-fighting systems. Due to changing operational circumstances, pressure and flows delivered to a service may vary. Designers are advised to make adequate provisions within the fire system installation for the pressure, flow and reliability requirements, for the life of the system. In the event that the developer intends to rely on the performance of Queensland Urban Utilities’ existing spring fire hydrant, on-site testing should be undertaken to determine that the hydrant is operating as required. It is the responsibility of the developer to ensure that the adopted hydrant meets the required performance.